Data from farms to play key role in widespread changes for improving soil health. Steve Berger, Soil Health Partnership farmer in Wellman, Iowa. It’s exciting that so many farmers want to test and share the impact soil health can have on the environment and farm economics with their peers. Twenty-five more farms have joined a groundbreaking research effort that could change the way farmers take care of their land. The Soil Health Partnership announced the addition of the new test sites at the 2016 Commodity Classic, March 3 – 5 in New Orleans. This spring, the organization begins in its third year identifying, testing and measuring farm management practices that improve soil health. 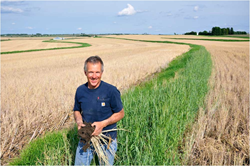 These include growing cover crops, practicing conservation tillage like no-till or strip-till, and using sophisticated nutrient management techniques. The program’s goal is to quantify the benefits of these practices from an economic standpoint, showing farmers how healthy soil benefits their bottom line. They also have positive environmental benefits, like protecting water from nutrient runoff. The new farm sites are located in eight Midwestern states. A farmer-led initiative of the National Corn Growers Association, the partnership receives funding from Monsanto and the Walton Family Foundation, as well as technical support from The Nature Conservancy and Environmental Defense Fund. Once enrolled, field managers from the partnership work with farmers to determine what practices might work best on their farms. They help the farmer gather soil, planting and tillage data from test plots. Starting in the 2014 growing season with 20 farms, the partnership plans to gradually increase the number of demonstration farms in the program to 100. Once a grower enrolls, the test site is included in research for five years. See videos of Soil Health Partnership farmers. The Soil Health Partnership brings together diverse partner organizations to work toward the common goal of improving soil health.